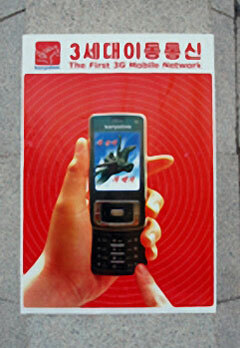 3G Mobile Phones in Pyongyang? Koryolink, the North Korean subsidiary of Egypt-based Orascom, claims it now has 100,000 subscribers in its first year and looks to add several million more over the next 5 years. The extent of this initial, pre-paid 3G subscriber feast north of the DMZ is indicative of powerful mobile access beyond the elite military leadership. Currently, Koryolink only provides domestic voice and text messaging with no international call or roaming service. There are some reports that mobile customers within metropolitan Pyongyang also have mobile internet service. Reportedly, Pyongyang is now laying fiber-optic cables in various provinces as a key component of IT infrastructure development looking toward the government’s stated goal of a “mighty and prosperous nation” by 2012. These IT developments in North Korea follow last month’s announcement that Americans would now be allowed into the country as tourists. Interestingly, North Korea’s business development moves contrast with harsh statements against the South Korean government for participating in the U.S. disaster preparedness contingency plan in the event of a Regime implosion in the North. The business moves also come at a time when North Korea is facing even harsher UN sanctions as a consequence of the nuclear issue. The business moves certainly look like the Regime is beginning to face the inevitable “opening up” required to move towards a more prosperous system. That “opening up,” whether by 3G networks, fiber optic cables, or American tourists wandering around the country, will place new and more stressful challenges on Pyongyang to maintain Regime stability and continuity. One only needs to look to the instability created within the former Soviet Union created by information about the prosperity and freedom of the outside world made more available to the population at large in the 1980?s as a result of American & Western tourists, fax and telephone.